Ryan has been writing since elementary school and gaming for even longer. Growing up on science fiction and fantasy, he began pursuing his passion for writing in the year 2000 with the first draft of The Orion Project: Descent. For National Novel Writing Month in 2009, he rewrote Descent. It’s a great deal better now. He’s written over 50 works, including published poetry, novellas, short stories and several full-length novels. In 2011, he won an Honorable Mention in Blizzard’s Global Writing Contest for ”Ashes over Stormwind.” Set in the universe of World of Warcraft, it is the story of General Marcus Jonathan fighting to survive as Deathwing sweeps down upon Stormwind at the beginning of the Cataclysm. Ryan lives with his wife, Laura and their perfect little girl, Caitlyn Jessica in Southern California with one very strange cat who always asks questions. They are expecting their second daughter–Talissa Stansifer–on November 5, 2013. Here is where you’ll get a glimpse into my head about once a week. I know it’s a frightening prospect, but if you made it this far, you can probably (?) handle it. I tend to post about my progression in my work on getting published and my various writings. Thoughts about life, the universe and everything. You know, the usual stuff. One of these days, I’m going to get published. In fact, I intend to have a story up on Kindle by the end of August. Yeah, I know that’s super close. And no longer do you have to wait! 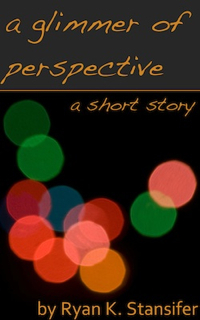 “A Glimmer of Perspective” is now available on Kindle, NOOK, and the Apple iBookstore. The Kindle version is $0.99 while the NOOK and iBook version are $2.99 to help offset the extra costs getting them up through that service. You should also be warned that there will likely be a fair amount of “My Little Pony” stuff in here. I know it’s a somewhat controversial fanbase at the moment, but in truth, I enjoy it. It gives me joy and happiness and I think we all could do with a little more cuteness in our lives. But dont’ worry, this isn’t a full Pony blog…even if adorable filly Fluttershy is dancing with a milkshake on my front page. In case you were wondering, this blog used to be called “Storming Dawn.” It was named after one of my first novel series, a trilogy of books called Rainfall, Sunrise and Dusk. It’s still sitting in a folder on my Dropbox, as I wrote it quite a while ago and I’m not sure if I’ll ever let it see the light of day. But I liked the title. Glad to see you’ve taken the plunge and started a blog! Way to go! I look forward to keeping up with your work and chatting now and again. And thanks for the follow on my Persephone Writes. I appreciate that. Star Wars and strange cats rule in our household, as well. Lots of fodder for randomly weird material and discussions, eh….? Thanks! You were actually the inspiration for this jump into madness. Now I just need to get working on it! Hang in there and remember it’s supposed to be fun. Do what you can and don’t worry about what you can’t Cheers!